To order a printed copy of the Esprit Ski - Family brochure, simply click the Request button below. 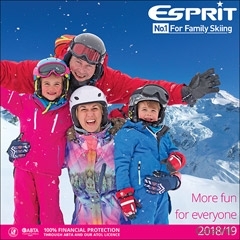 You can download the Esprit Ski - Family Brochure instantly as a digital iBrochure [?]. View the Esprit Ski - Family Online Brochure Now! They cover every angle for the skiing family, with dedicated Esprit Nurseries for babies and toddlers, exclusive Esprit ski classes for older children, plus fun–filled activity clubs. Esprit Skii offers catered chalets and Chalet Hotels, all with free wifi, in 13 of the top resorts in the Alps. Order your Esprit Ski brochure now for the perfect family skiing holiday! By pressing the Request Printed Brochure button you give consent to Esprit Ski - Family (and their Data Processors for the specific purpose of delivering your literature) to send you their Brochure .